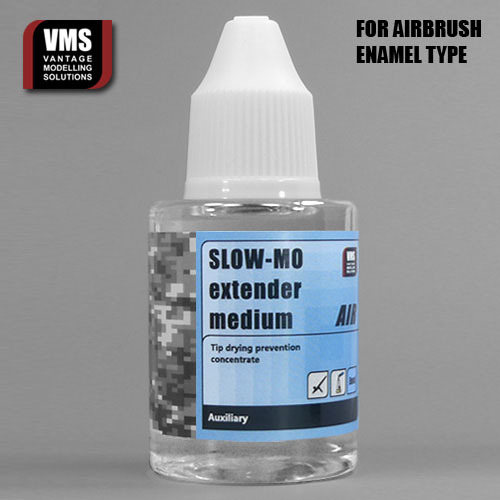 VMS Slow-Mo Extender is dedicated for airbrush, simply mix it with your favourite thinner and enjoy longer open time of your paint. With Slow-Mo drying extender you will be able to mitigate all tip drying related issues. During airbrushing the airflow makes paint dry much more faster, that's why this products comes as high potency concentrate. Typical usage is between 5 and 15% in your thinner which translates to 25-100% longer open times. This product is compatible with enamels by Humbrol®, Tamiya®, Revell®, Model Master® and equivalents. Not suited for acrylics!